What system do you use to manage your inventory? What do you use to collate orders into picking lists? How do you manage goods inwards? I’d like to tell you about how we manage our inventory. Over the last year I have been learning how to use FileMaker Pro. It is a program that has huge potential. This is one of its drawbacks. It takes a long time to master. But once you do you can use it to make a bespoke system tailored to suit your company’s needs that can grow and evolve with you allowing you to add features as you need. One of my favourite features is that I can access and update our stock on my iPhone. Our database is hosted on a server. So all information is always up to date. When I am in the warehouse, where we don’t have computers or broadband, I can receive an order on my phone, check its location, mark it as picked. This allows us to update stock levels. Filemaker Go for iPhone/iPad offers lots of potential. The container fields allow us to photograph book jackets and feed them to the websites where we sell our stock. You can see that containers also allow the user add audio, signatures and PDFs. 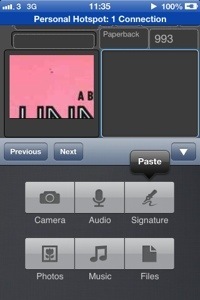 Siri allows the user to add text using the phones microphone. I have CNS Barcode Reader integrated with our database. This nifty feature allows us to scan our books’ barcodes on the iPhone. It is a pleasure to use. FileMaker Pro is great for adding goods to our inventory. We programmed it to scrape information about our books from amazon. So when we add a new book we type in the ISBN and press a button. The rest of the information is scraped in a couple of seconds. The scraping feature is one of my favourite features. I’m developing our database to scrape our orders from amazon and our other market places automatically and getting it to push the orders to us. Isn’t this just the same as email? No. When I mark the order as posted FileMaker Pro will tell Amazon that the order has been shipped. Depending on where the order ids going I can get FileMaker Pro to email the customer just after the expected date of arrival of the shipment asking him/her for feedback – timely and effortlessly. It creates a really professional impression on the customer. I’m also in the process of developing our database to scrape prices from bookfinder.com. I’ll use an algorithm to competitively price our books. You may say that what I am doing here can already be done by fillz or monsoon. The beauty here is that I can change how our price is worked out and I don’t have to pay a commission for the privilege. I can send customers a snapshot link of our inventory based on a find according to my their preferences. The customer will receive this smart find in the form of an app. 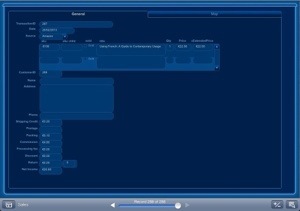 The interface is absolutely gorgeous especially after Filemaker introduced new themes last year. 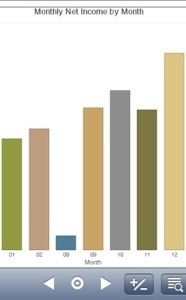 It is also easy to produce charts, from live, updating data, showing your best sellers, customers, regions etc. Please let me know what are your favourite features of your inventory management system.